Buy 1 for $18.20Buy 2 / Save $0.97!Buy 3 / Save $3.64! Camomile is perhaps the best known of herbal teas besides peppermint. English camomile tea has tonic, stomachic, diaphoretic, soporific, and antispasmodic qualities. German camomile is tonic, sedative, carminative, emmenagogue and diaphoretic. It is used in helping support colic, diarrhea, insomnia, indigestion, toothache, swollen gums, skin problems, gout, sciatica, and a host of other ailments. Both camomiles have been used to help support immunity issues. As a good rinse for blonde hair, steep the dried flower heads in hot water, cool the infusion, then strain. Extracts of the two species are used in cosmetics such as hair dyes, shampoos, sunburn lotions, bath lotions, and other products. The oil can be used as a fragrance in soap, detergent, perfumes, and lotions. The oil of German camomile contains chamazulene, farnesenee, alpha-bisabolol and other components. High-quality oil should be of a deep blue color. The oil has bacteriacidal and fungicidal properties. 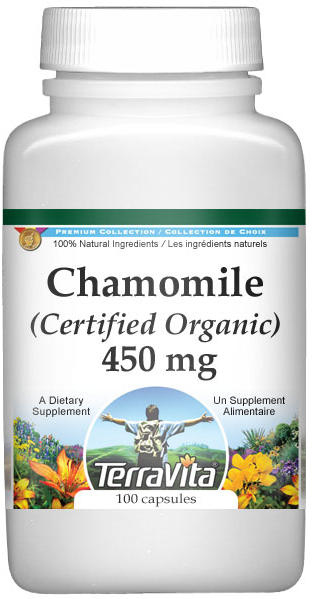 The component chamazulene is anodyne, antispasmodic, anti-inflammatory and anti-allergenic. The plant also contains flavonoids, coumarins, a polysaccharide, choline, and amino acids. Individuals allergic to ragweed pollen may, theoretically, suffer life-threatening symptoms by drinking camomile tea. However, only one report exists in the periodic scientific literature confirming an anaphylactic reaction produced by drinking camomile tea. Its long history of safe use would suggest that the great majority of people will have no adverse reactions from an occasional cup of tea. In large doses, Roman camomile may be emetic. Camomile is one of those ambiguous common names applied to a variety of closely related species. We will concern ourselves with two species: Hungarian or German camomile, Matricaria recutita (Matricaria chamomila), and Roman or English camomile, Chamaemelum nobile (Anthemis nobilis). German camomile is an annual native of Europe and western Asia, growing from one to two feet high. It has a pale green, smooth, shiny stem with striations. The finely divided linear leaf segments are borne on numerous branches. The many terminal flower heads are in a comb-like formation and are about one-half to five-eighths of an inch in diameter. The disk flowers are yellow surrounded by ten to twenty white ray flowers. The receptacle is smooth, conical, elongated, and hollow inside. The fruit is a slightly curved, pale gray, smooth achene. English or Roman camomile, a perennial native to Europe, is a low-growing herb with a creeping rhizome reaching a foot in height. The stems are branching, slightly hairy, and usually prostate or drooping, though sometimes erect. The downy, alternate, green-gray leaves are flattened and feathery in appearance. The flower heads are about an inch across and sparse compared with German camomile - a solitary head sits atop each flower stalk. The disk flowers are yellow; the ray flowers are white though sometimes absent. The receptacle is conical and solid. One showy double-flowered variety has large white blossoms. Nearly all the yellow disk flowers become white ray flowers. A petalless flower form is available from some herb plant sellers. "Treanague" a cultivar named after the estate from which it originated, is flowerless. German camomile is grown from seeds sown directly in their garden location. The plants will self-sow freely. Watch out. They can become weeds! The seed bed should be well prepared as these seeds are very tiny. They can be scattered on the soil's surface, then gently ramped down with the flat side of a hoe. Sow as early in the spring as possible, as seedlings tend to become leggy and flower quickly under hot summer sun. Young seedlings, about one to two inches tall, are easily transplanted. Older seedlings do not survive transplanting well. If planted around the first of June in the North, expect flowering late July or early August. Blooms develop continuously. Full sun and a moist sandy loam suit German camomile. Soil pH should fall between 6 and 8.5. English camomile likes full sun and a slightly acid-to-neutral garden soil with good drainage. It does not tolerate hot, dry weather. English camomile can be started from seeds, cuttings, or by root division. Seedlings should have a six-to-twelve-inch spacing. When cultivating with a hoe, cover exposed or loose roots with soil. A rich soil will produce a lush leaf growth but few flowers of English camomile. An acre may yield 400 to 600 pounds of the dried flowers. England produces most of the flowers. Most seeds purchased as camomile, and dried camomile for tea, can be expected to be Matricaria recutita, grown commercially in Hungary, Egypt, Argentina, Belgium, Russia, Bulgaria, and Germany. To determine whether dried camomile flowers are German or English, carefully slice open the receptacle of the flower head. The receptacle of the German is hollow; the English is solid. Tea-bagged camomile often contains seeds. Tear open a package, plant the contents, and see what happens. Preparation and Dosage: Infusions of one to two teaspoons of the product in a cup of boiling water are taken three times per day. Small amounts (1%) may be added to herbal tea mixtures as a brightening agent. Liquid extracts (1:1 extracts in 70% ethanol) may be used at a dose of 1 - 4 mL three times per day. The pale blue essential oil is used in aromatherapy.